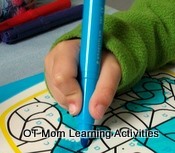 OT Mom’s Fine Motor Story! This is my own fine motor story about how my 2 sons had completely different experiences with their pencil grasps!! My older son went to the local nursery school a couple of days a week from the ages of 2 - 5 years. Although he had some gross motor and coordination delays along with his sensory processing disorder, his pencil grasp was developing quite adequately through the various stages. Alas, one week when he was 3 years old, unbeknownst to me, a replacement teacher unfamiliar with that age group forced him to try and hold the pencil “properly”. The result? An extremely awkward and inefficient pencil grasp, and a child who promptly gave up drawing and coloring as soon as any effort was made to persuade him to hold the pencil more appropriately. It took months of patient coaxing to get him to engage in fine motor tasks with me, and the best ones were the ones that had no crayons in sight (see some of the hand exercises I used). He still prefers to use a pencil gripper but he has developed good finger movements which help him to write quite quickly and neatly (most of the time!!) Homeschooling him has been a great help, as in the first 2 years of school, I was able to schedule frequent “fine motor breaks” with some shoulder exercises and core exercises as well. My younger son, who has been at home with me most of the time, went through all the stages at his own pace, but with lots of scissor cutting activities and other fine motor games to make sure his hand muscles were developing appropriately. At one point, when he was 5, I was wondering if I needed to coax him to move from a 5 point grip to a 3 point grip, but I decided to let him progress at his own pace, and by age 5 ½ , he had started using 3 fingers on the pencil. 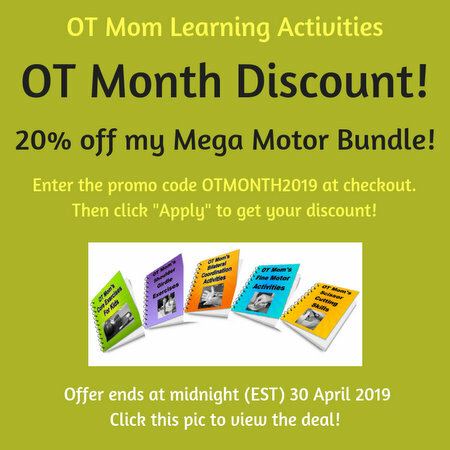 As a homeschooling mom, I am privileged to be able to structure tasks according to his needs, so in the months to come, as I introduce some more formal schooling tasks, I will make sure his little fingers get lots of fun finger exercises to help him along. I’ve shared my story – do you want to share yours? Perhaps other parents will be encouraged by what you have to say!